Oman, offically titled the Sultanate of Oman, is an unique country in the Middle East. Although it shares many of the cultural characteristics of its Arab neighbours, particularly those of the Gulf Co-operation Council, its strategic location on the Persian Gulf and fascinating history as a powerful trading empire in past centuries, have left it with some amazing differences. The geography of Oman is varied with desert, mountains and wadis. Mountain ranges are situated in the north and south east of the country with the central area mostly gravel desert. The Arabian leopard, oryx, tahr, gazelle and wolf inhabit the mountain areas with turtles and whales found at the coast. Cocount palms fringe the beaches of the coastal areas whilst frankincense, acacia and oleander are produced in the mountain regions. 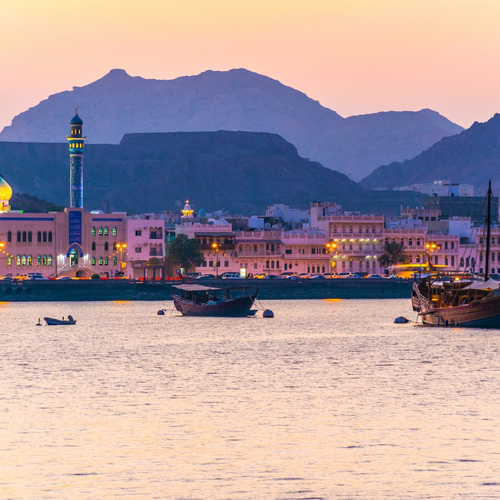 The capital city, Muscat, is just 4 hours drive from Dubai and a short flight away from India, Africa, Zanzibar and the Maldives. Evidence of early Nubian artifacts found in 2011, revealed that Oman has been inhabited by humans for over 106,000 years. Over centuries, many tribes from Africa, Arabia and Asia have settled in the country making their living from fishing, farming, herding and stockbreeding. In 1497-1498, the Potuguese captured and settled Muscat building their fort for the protection of their shipping routes to India. They ruled Oman for 150 years until the city of Muscat was captured by the Ottoman Turks who, in turn, were later driven out by the Omani tribes who have ruled the country to the present day. 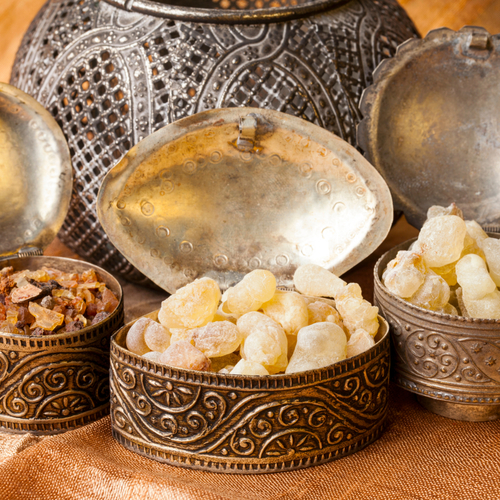 They built a large trading empire, making Muscat a powerful port city. From the late 17th to the early 20th century, the Omani Sultanate was a powerful empire vying with the European maritime powers, Portugal and Britain, for influence in the Persian Gulf and Indian Ocean. At its peak in the 19th century, Omani influence extended east across the Strait of Hormuz to Iran and Pakistan and as far south to Zanzibar, hence the reason Swahili is still spoken in Oman. Muscat was the main sea port of the Persian Gulf and an important port of the Indian Ocean. Oman and Britain formed strong relations for the protection of the British sea routes to India with Britain helping to maintain the territorial integrity of the unitary Omani state. After deposing his father in 1970, Sultan Qaboos, embarked upon a policy of modernisation and political and economic reform increasing spending on health, education and welfare. Oman became a founding member of the Gulf Co-operation Council in 1981 and by 2002, voting rights were extended to all citizens over the age of 21. Oman has the 25th largest petroleum and 28th largest natural gas deposits in the world and its economy remains dependent upon these despite the pursuit of economic diversification. 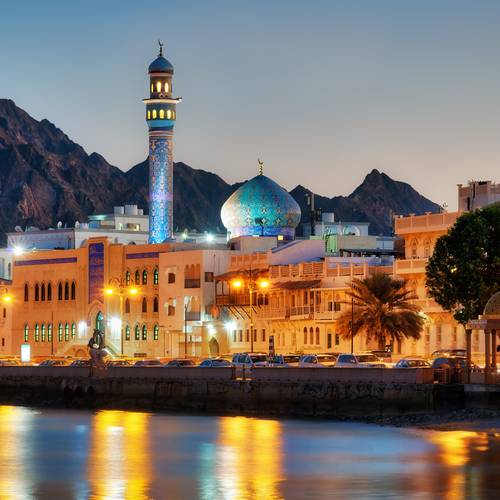 Tourism is the fastest growing non oil based industry and Oman is now one of the most popular destinations in the Middle East, renowned for its adventure and cultural tourism. Agriculture and industry are small sectors and fairly primitive and Oman is still a net importer of food. Sultan Qaboos is an avid devotee of classical music, particularly Mozart, and started the Royal Oman Symphony Orchestra in 1985. This orchestra is unique in being made up of Omanis who are selected and trained in Oman from a young age. The orchestra performs at the Royal Opera House in Muscat. The Oman Centre for Traditional Music was founded in 1984 to preserve the over 130 different forms of Omani songs and dances. The Sultan's flagship cultural institution, the National Gallery of Oman opened in July 2016 with 14 permanent galleries showcasing national heriatage from the earliest human settlements in the Oman Peninsula to present day. The Beit Muzna Gallery is the first art gallery to open in Oman in 2000 serving as a place for new emerging Omani artists to exhibit their works. The Omani Society for Fine Arts offers workshops, educational programes and artists grants for practitioners in varied disciplines. The Bait Al Zubair Museum showcases Omani architecture and artifacts over the centuries. Oman's traditional sports are dhow racing, horse racing, camel racing, bull fighting and falconry. Bull fighting, interestingly, is permitted only in Oman and Fujeira, UAE. Recently football, basketball, cricket, waterskiing and sandboarding have become fashionable and popular sports. The Ministry for Sports Affairs set up in 2004 plays a very active role encouraging sports participation in the Omani population and organising international tournaments. The Tour of Oman is a professional cycling 6 day stage race held in February of each year. The Sultan Qaboos Sports Complex stadium has a 50 meter swimming pool which hosts international competitions. Oman is an excellent location for the expatriate worker. More liberal than the other Gulf states, it has a more varied and exciting geography, mountians and beautiful beaches, cultural and sporting activites and excellent travel routes to explore neighbouring countries and continents. This video, from BP. provides some insights.